Melbourne’s Southbank development dubbed Australia 108 is in its final stages of planning with construction rumored to be starting this year. 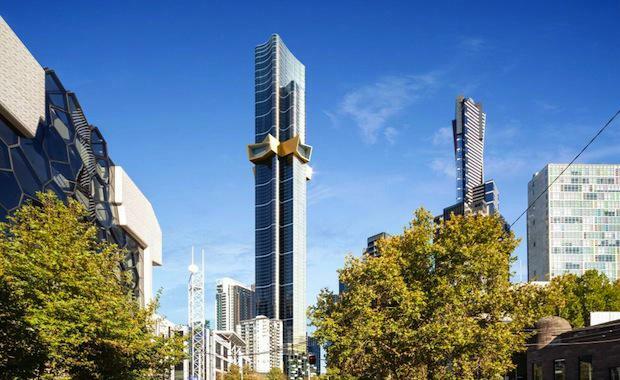 The 319 meter mixed residential and public tower, will surpass that of it’s neighbour Eureka Tower, which was previously Melbourne’s tallest building. Australia 108 will contain 1105 luxury apartments, including 790 super penthouses, a two-storey lobby featuring bars and restaurants, and a 228-room-hotel complete with a sky-deck on top. CBRE’s Melbourne Residential Projects Managing Director, Andrew Leoncelli described the project as “the most exciting release of an apartment project in Melbourne’s history” as he unveiled the display suite set at the official project launch last week. According to the Sydney Morning Herald, the tower was previously said to stand at 388 meters, but initial plans were rejected after Fairfax Media revealed the building violated federal air safety regulations. Despite the set back in planning, Singaporean billion-dollar businessman Koh Wee Seng, sees the project as “iconic”. “Residents will experience living in the clouds. This is a game changer for Melbourne,” Mr Seng told Property Observer. Former Melbourne Planning Minister Matthew Guy expressed his strong support of the development. “It builds on what we’ve been calling for, which is a large, dense, 24 hour CBD, an area which can take the pressure off our existing suburbs. Taller buildings… are a symbol of a growing nation, a strong economy, and they do have the ability to define a city,” Mr Guy told Channel 7. Mr Leoncelli told of the premature success of Australia 108 last week at the launch, telling that over 200 sales have been secured at the Southbank Project. “To break the back of the sales is a very proud achievement,” Mr Leoncelli said. The tower is predicted to be complete in 2019, generating an estimated $1 billion in revenue.